Being in the golf travel industry for almost 13 years now, I've had the privilege to stay and play at some of the most premier golf resorts in the world - The Boulders in Scottsdale, Reunion Resort in Orlando, Kapalua in Maui, Barton Creek in Austin, La Quinta in Palm Springs, and of course, Pebble Beach to name a few. Sorry fellas, but move over - The Resort at Pelican Hill is simply the best I've ever experienced. It started last Thursday with a quick flight from Phoenix to Los Angeles where we picked up a convertible, put the top down and took our time on the the hour drive south down the Pacific Coast Highway to Newport Beach. You can get there faster by taking the highway, but the views from the PCH are worth the extra time... Being a villa guest allowed us to skip the hotel lobby and go right to the Villa Clubhouse to check in. Within 10 minutes, we were back in the car, went around the corner and were greeted in our driveway by our personal butler Jarek. He had us settled in and on the back patio with champagne on ice within 15 minutes, and all was well with the world. The 2500-square-foot, 3-Bedroom oceanfront villa is, in a word - ridiculous. Beautifully decorated, sub-Z refrigerator, every amenity you could think of... Even a "flick of the switch" fireplace, but the truth is you probably won't ever sit on the couch. It's all about the back patio. Enormous with lounge chairs, a table for 4, and directly facing the Pacific Ocean, the back patio is where we spent the majority of our time. Click below for a video of our villa. Had dinner at Andrea with the girls and was intimidated by the wine list, but somehow managed to struggle through. Friday - Dropped Abby at Camp Pelican for a half-day to tee it up. There are 36 holes onsite- the Ocean North Club, and Ocean South Club - and the 18-hole Oak Creek Golf Club, about a 20 minute drive inland. All Tom Fazio designs, and all impeccably maintained. I played the Ocean North course in the morning, and then drove the South course in the afternoon. Being a desert guy, I was surprised at the elevation changes at both Ocean courses, as I thought Oceanside golf would be more flat and traditional. Greens were fast and true, and playing with a forecaddy makes a nice difference. 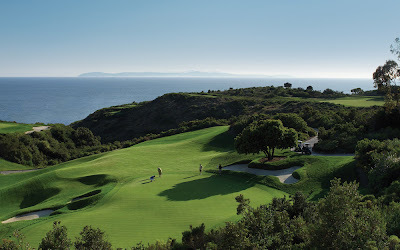 The traditionalist will love the Oak Creek course, but I'm an Ocean North guy. Had an awesome lobster sandwich afterwards, sitting on the back patio at the Pelican Grill. Called our butler before going back to the villa to deliver a bucket of ice with champagne and a Scrabble game for the evening's entertainment. Michelle beat me as usual, but I managed to squeak out a win over my 8-year-old whiz kid. Took Abby to the private Villa Pool for late-night swimming, and alternated between the salt water pool and Jacuzzi. Saturday - Drove the girls inland to check out Oak Creek, and then headed to Balboa Island and took the auto ferry across to endure Boardwalk-type festivities and ice cream for the kiddo while dreaming of the back patio at our villa... Ordered room service and had the sea bass with veggies, which was fabulous on the back patio - with you guessed it - more champagne. Went a different direction on this night, having our butler pick all three of us up and take us to the Coliseum Pool - taught Abby a new word to describe it... decadent. One feature that I didn't think I would use much, but ended up using A LOT, was the complimentary Mercedes coach transportation. Call your butler, and they're there within 5 minutes to take you wherever you want to go, which was super-convenient and safe. Sunday - Sadly had to leave, but made it to LAX in about 50 minutes going highway this time. Was back at home in Phoenix in time to watch the final round of the Match Play with a big ole smile on my face. What a weekend. What a place. Contact Chris Parcell with any other questions at 888-867-6911, and I'll email you a customized itinerary for your own Pelican Hill trip.